The holidays are just around the corner! Typically, December is when parents give their nanny and end-of-year bonus. However, families may feel like giving something more, or even a little more personal. When giving your nanny something other than a check, you want to make sure your gift represents how much your family appreciates them! Think about your nanny, who they are and their interests, and tailor your gift to them. Here are some of my favorite gift ideas for budgets of all sizes. Happy shopping! Gifts from your children to their nanny should be very specific to their relationship. Think about the things they typically do together and use their shared experiences to inspire a gift idea. Does your nanny take the kids on countless adventures? 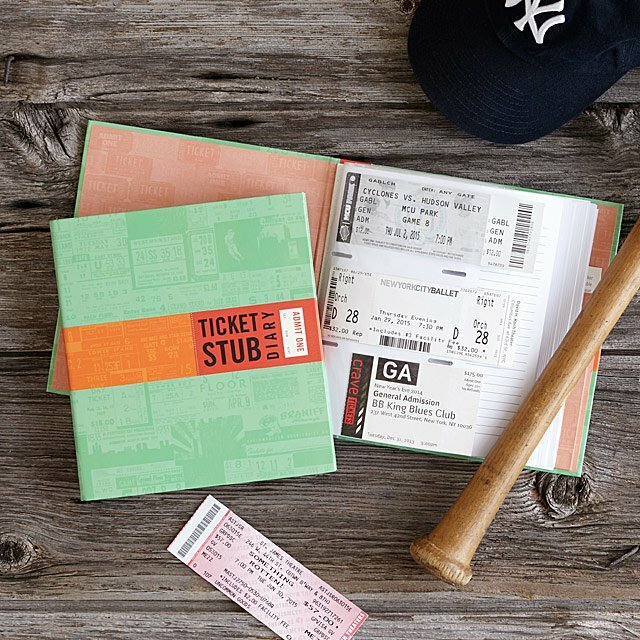 Capture these moments with this sweet ticket-stub diary! Now your nanny can save the ticket from the aquarium, zoo or museum visit and cherish the memories they shared with your children forever. Go a step further and have the kids help you fill in the diary before giving it to your nanny. If you don’t have some of the actual ticket stubs, have your kids create their own “Admit One” tickets with the date and location. Available on UncommonGoods for $14. Is your nanny particularly creative? If he or she spends a lot of time coming up with clever crafts to do with the kids, have your children say thanks with some crafts of their own! Not only is it a sweet gesture, but adult coloring can actually relax the brain—which is a nice reminder to your nanny to take time for themselves and enjoy the holiday break. Have your child or children pick out a coloring book they think the nanny would like, and have them color in one page with a sweet note to your nanny. This is a relatively easy gift to coordinate, so have some fun with it. This gorgeous mandala coloring book comes with twelve double-sided colored pencils and retails for $15 on Amazon! Winter is the perfect time to get cozy and indulge in some sweet treats! This is one of my favorite gifts––it’s simple and oh so sweet! Pick a mug with your nanny’s first initial (I like this $8 one from Anthropologie) and stuff it with some of his or her favorite candies and teas. This is a very thoughtful way for your kids to thank your nanny for all they do! I know that families are not always in the position to give nannies a bonus at the end of the year. If you plan on giving your nanny a reduced bonus for financial reasons, consider adding a little something extra! Not only will it make up for a slightly smaller check, but your nanny will sincerely appreciate the personal touch. Consider one or two of these gifts for your nanny this holiday season. Is your nanny a bit of a glam girl? Me, too! This jewelry tree is super sleek and a great way to organize necklaces, earrings and bracelets. The solid gold color looks great in almost any room. Plus, this gift shows that you’ve noticed your nanny’s likes and interests! Go a step further and consider getting her a personalized necklace with her initial. You can find this tree at Target for $34! Is your nanny a big-time sports fan or music buff? I always love giving experiences, and a credit to a third-party ticket vendor is a great gift. By buying individual tickets, you run the risk of your nanny being unavailable and unable to use your sweet gift. Plus, StubHub lets you attach an image or audio recording to your e-gift card, so you can make the gift more personal. Purchase a $25 or $50 gift card and thank your nanny for all they do! Some nannies are hard-working students, work multiple jobs or have families of their own! If this is your nanny, I’d bet money that they’d appreciate an extra jolt of caffeine throughout the day (who wouldn’t?)! This single-serve coffee maker from Keurig is available at Walmart for $59! If you’re looking to substitute a large part of or the entire amount of your nanny’s bonus, or just feel extra generous this holiday season, these gifts are both thoughtful and big-budget friendly. If your nanny has caught the travel bug or is planning their next great adventure, a travel suitcase is a perfect gift! Both thoughtful and practical, a suitcase fills a need your nanny may have and lets them know that you support their vacation plans! Asking for time off can be difficult for nannies to do. They become attached to the children and understand that it can be a scheduling obstacle for the parents. This travel-themed gift reassures your nanny that a little PTO is both OK and well-deserved! This AWAY carry-on ($225) is a perfect size, comes with a portable charger, and you can even monogram it for an extra special touch. A Kindle is the perfect gift for the reader in your life, but especially for your nanny! They probably spend a lot of time reading with your children, and a Kindle is a great way to encourage reading of their own. The new Kindle is waterproof––AKA, prepared to be around some fun-loving kiddos! To make the gift even more special, give your nanny a gift card to download their favorite reads right away. Find the Kindle Paperwhite on Amazon for $130.